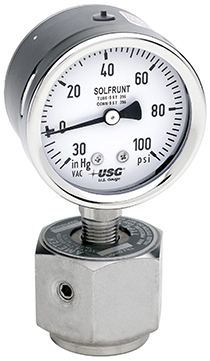 When safety is your top priority, the new Model 659 Series SOLFRUNT Gauge is the choice. The Model 659 pressure gauge provides users with a solid-front case design and pressure-relieving back design in all stainless steel construction. These pressure gauges are available in both 2½" or 4" sizes, in panel mount and low mount configurations. The liquid fill minimizes the effect of these severe environments, protects the gauge internals, and provides continuous lubrication on the mechanism, all adding up to extended service life. Liquid filling also provides greater protection of the gauge internals from corrosive atmospheres. The Model 659 SOLFRUNT is ideal for applications in chemical and petrochemical processing, offshore equipment, exploration, petroleum storage, and many other demanding applications. The 659 is available dry or liquid-filled with glycerin, mineral oil, or silicone DC-200.